The Sicilian olive that even olive haters love. Go for salty cheese & roasted peppers. 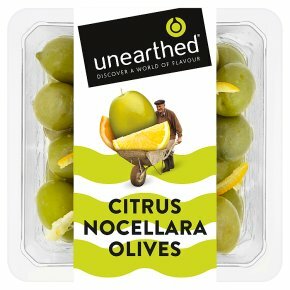 Suitable for vegetarians.Our Food Discoveries Citrus Nocellara Olives We really do go the extra mile to find the finest food - in this case all the way to the med. We discovered these plump olives in Sicily's lush Belice valley; True to local tradition they haven't been soaked in brine so they keep their natural bright green colour and mild, buttery taste. Offer these to someone who thinks they don't like olives and we practically guarantee love at first bite.